1867: Completed by Fredrickson & Fawcett, Burton upon Strather for F. A. Castle, Grimsby as YARRA YARRA. 10.1867: registered at Grimsby (GY252). 3.1869: re registered at Grimsby (GY22). 9.1869: Sold to E. Goodfellow, Grimsby. 1.1.1870: Owned by Henry Knott, Grimsby. 1.1.1883: Owned by Robert Sinclair, 23 Albert Terrace, New Clee, Lincolnshire. 1.1885: Sold to W. Hall, Grimsby. 5.1887: Sold to Great Grimsby Fishing & steam Trawling Co Ltd, Grimsby. 9.1888: Sold to George E. J. Moody, Cleethorpes (Walker Moody Kelly, Fleetwood, manager). 1.1.1892: Owned by Mrs J. W. Campbell, 51 Brisbane Street, Greenock (John H. Campbell, 12 Charles Street, Greenock, manager). Fleetwood registry closed. Registered at Greenock. This entry was posted in Sailing Trawlers and tagged Dandy on March 8, 2011 by Fred Smith. 1873: Completed by ? ?, St. Ives as SPRAY. 1874: Owned by Isaac M. Sibbald, Morecambe. 4.11.1875: At Whitehaven in company with AMETHYST (FD107) refused to pay harbour dues and attempted to leave the harbour although the tug was moored across the harbour to prevent them leaving. Hit the tug smashing her boat and cut her lines forward with an axe. Boarded by harbour master and mainsails confiscated. 6.11.1875: Skippers attended at the office of the solicitors to the Harbour Trustees and consented to pay all dues, damages and costs. Sails returned and allowed to sail. 1.1.1880: Owned by William Hudson, Fleetwood. Registered at Fleetwood (FD147). 1.1.1888: Owned by Mrs Margaret Hudson, 48 Warren Street, Fleetwood. 1.1.1889: Owned by James Armour, Adelaide Street, Fleetwood (managing owner). 6.11.1890: In Morecambe Bay in SSE force 8 gale, driven on to Pilling Sands; crew saved and landed at Fleetwood. 07/03/2011: Page published. 2 updates since then. This entry was posted in Lost Vessels, Sailing Trawlers and tagged Dandy, Lost, Sloop, William Hudson on March 7, 2011 by Fred Smith. 1867: Completed by ? ?, Grimsby for T. G. Vivian, Grimsby as CONQUEST. 11.1867: Registered at Grimsby (GY253). 3.1869: Re-registered at Grimsby (GY7). 9.1873: Sold to James Sorrensen, 42 Cogan Street, Hull. Grimsby registry closed. Registered at Hull (H830). 1.1.1875: Owned by William Little, Hull. 1.1.1880: Owned by Carl A. Nielson, 42 Cogan Street, Hull. 1.1.1888: Owned by Rasmus Jensen, 12 Humber Avenue, West Dock Street, Hull. 1.1.1889: Owned by Mrs Elizabeth Jipson, Boulevard, Hull. 1.1.1890: Owned by Mrs Anne Holden, Sunnyside, Ainsdale (Thomas Smith, 18 Aughton Street, Fleetwood, manager). Registered at Fleetwood. 02/01/2010: Page published. 2 updates since then. This entry was posted in Sailing Trawlers and tagged Dandy, No Fleetwood owners on January 2, 2010 by Fred Smith. 1884: Completed by G. B. Meagher & Co, Swansea as SWALLOW. 1886: Registered at Ayr (AR89). By 1887: Owned by John Waring, 16 Kent Street, Fleetwood & J. Cookson, Fleetwood. 1907: Sold to William Poole, 10 Back Kent St, Fleetwood (64/64) (managing owner). 30.10.1907: Registered at Fleetwood (FD151). 1.6.1908: Probate granted to John Robert Sumner, Fleetwood. Vessel transferred to him. 7.7.1908: Sold to George William Stennett (22/64); William Henry Blackhurst (21/64) and John Edward Singleton (21/64), all of 80 Dock Street, Fleetwood (George William Stennett managing owner). 6.10.1908: Sold to John Edward Singleton (22/64), Dock Street, Fleetwood; Henry Melling (21/64), Jubilee Pier, Fleetwood and William H. Blackhurst (21/64), Crown Hotel, Dock Street, Fleetwood. 23.10.1908: John Edward Singleton appointed managing owner. 20.7.1909: Fitted with auxiliary motor 6 nhp. Re-measured 8.7ft depth 57.54g 37.53n. 24.7.1909: Re-registered as an auxiliary motor trawler. 4.8.1909: Sold to The Swallow Fishing Syndicate Ltd, Dock Street, Fleetwood (John Edward Singleton, manager). 14.2.1912: Vessel foundered in Morecambe Bay and totally lost. 1.3.1912: Fleetwood registry closed “Vessel sunk – total loss. 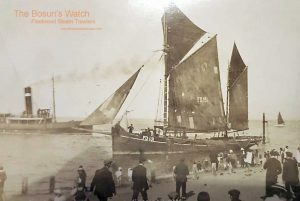 This entry was posted in Lost Vessels, Sailing Trawlers, Steam Trawlers and tagged Blackhurst, Dandy, George William Stennett, Henry Snelling, John Edward Singleton, John Waring, Lost, Swallow Fishing Syndicate, William H, William Henry Blackhurst, William Poole on February 23, 2009 by Fred Smith. 1910: Completed by Liver & Wilding, Fleetwood for William Leadbetter, 8 Ash St, Fleetwood (managing owner) as Surprise II. 21.9.1910: Registered at Fleetwood (FD122). 19.7.1920: Fleetwood registry closed. Sold to foreigners (Belgian subjects). This entry was posted in Sailing Trawlers and tagged Dandy, Liver & Wilding Ltd, William Leadbetter on February 23, 2009 by Fred Smith.